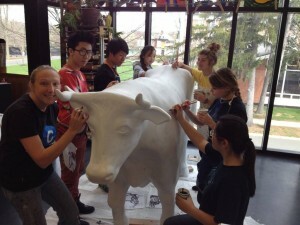 The Pennington School Art Club developed the design of our Arty the Ox through a group conversation about how the group could best represent its mission, which is making everything beautiful for all. Pennington’s art students continuously embark on artistic adventures that create beauty for others. We’ve revamped, restored, and decorated buses, garage walls, office walls, classroom stools, holiday trees, and much more. We like making beauty, collaborating on ideas, and sharing our artistry with the world. Arty’s design was originally created by 8th grade member, Jessie Liu, and was then tweaked by Liz Childers, Annie Yuan and Caroline Hall. Jessie’s black, white and red design won the votes of the twenty-two students in art club for the best representation of The Pennington School. We first considered making the oxen face a Red-tailed Hawk, our School’s mascot, but decided instead to keep the oxen shape intact and morph our maze-like designs into the ebb and flow of the structure. Hidden within the design are elements of Pennington Art-- palette, paintbrush, pencil, our School cupola, and the words ART CLUB and TPS. The horns are bejeweled with plastic gems, and our color scheme is black and white with hints of medium red--our school colors. We also included the colors of the color wheel on Side 2 (red, orange, yellow, green, blue, violet). We like the idea of Arty “painting the town red” so we detailed the end of his tail as a paintbrush dipped in red paint. Our hope was to create a piece that is visually appealing and representative of both The Pennington School and the beauty found all around us. Caroline Hall is a painter. She is a female artist working as a teacher in the twenty-first century. A wife, a friend, a sister, a daughter, a granddaughter and an art teacher juggling everything in her life so she can find the time she needs to make art. She is passionate about her work; be it a drawing, a painting, a collage or a sculpture, a lesson, a sketch, a large painting or doodle, each piece has my unique application of the materials she has available to use. She loves connecting her work to nature, to the trees that line her daily walk from building to building at school, to the woods and world she sees on her runs and hikes in nearby neighborhoods, cities and states, to the flowers she grows in her garden, and the rolls of my skin as it moves across muscle and bone; everything catches her eye and draws her in to investigate it further. Caroline’s work consists of, but is not limited to, her observations of the human body (specifically hers), trees, flowers, close friends, and images from her imagination and dreams. The fluidness of Georgia O’Keeffe’s paintings and the vivid, detailed and emotional works of Frida Kahlo influence her to do this day. She loves seeing her students have “ah ha” moments. She finds their excitement to be invigorating and often contagious. It is her plan to continue painting, drawing and creating new work as long as she can. She likes being the lady who sees people in trees, who loves shadows on the ground and wants to recreate everything she sees around her. Annie Yuan believes that an artist herself is an inspiration of her artworks. She takes ideas through observation and reinterpretation of things that speak to her in her daily life. Incorporating surrealism and animation, in her artworks, she hopes to display her personality - a sense of quirkiness and an aspect of her life as a teenage girl. Graphite serves as her main medium while she extends her palette to colored pencils, ink, acrylic, and three-dimensional sculpture. To Annie, medium does not limit the possibilities of ideas, but allows her to discover a different approach when expressing her ideas. Jessie Liu is a a 14-year-old budding artist who started studying art when he was four or five in China. He likes sketching and copying cartoons in his spare time. Chad likes drawing and observing the world around him; drawing makes him relax. His favorite artists are Van Gogh and Hayao Miyazaki. Liz Childers started drawing when she was a little girl. She doesn’t know what it is like not to be an artist. To be an artist is a way of life that encompasses her physical, mental, spiritual, and emotional being. Through the use of nonverbal communication, Susan can express her inner thoughts and feelings in a creative way that is uniquely her; art is part of her identity. The materials that she thoughtfully chooses and the way, in which she executes the art piece, reveal how she makes meaning of her life. She remembers being drawn to art in second grade with her art teacher, Mrs. M., when the class was asked to draw an animal of his/her choosing. Susan chose to draw a panda bear because it was her sister’s favorite animal and ended up giving it to her for her birthday. Giving away art makes her feel good; it is a piece of her that she can give to others. Art is a way of communicating on a different level without using language. When she creates art it feels like having a secret inside of her and then releasing it. A story can be told or a message can be given using art as the method in which to connect. Using her mind and hands she can create an innovative expression that reaches out to join with another person without the use of words.